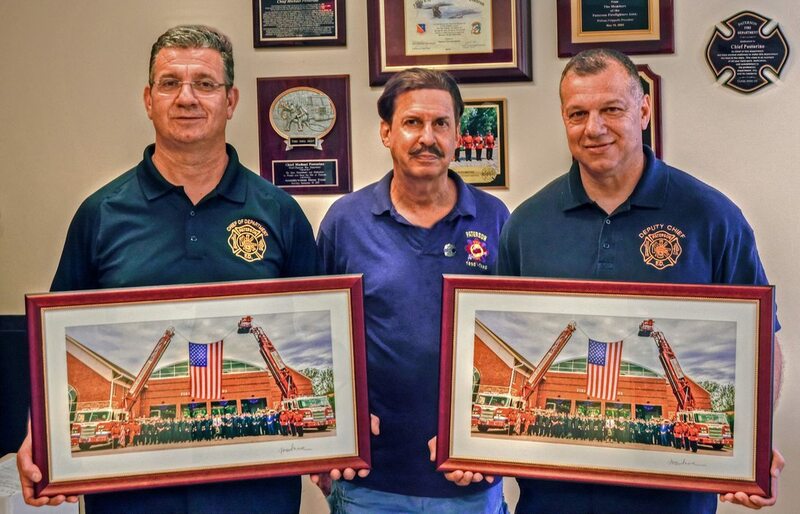 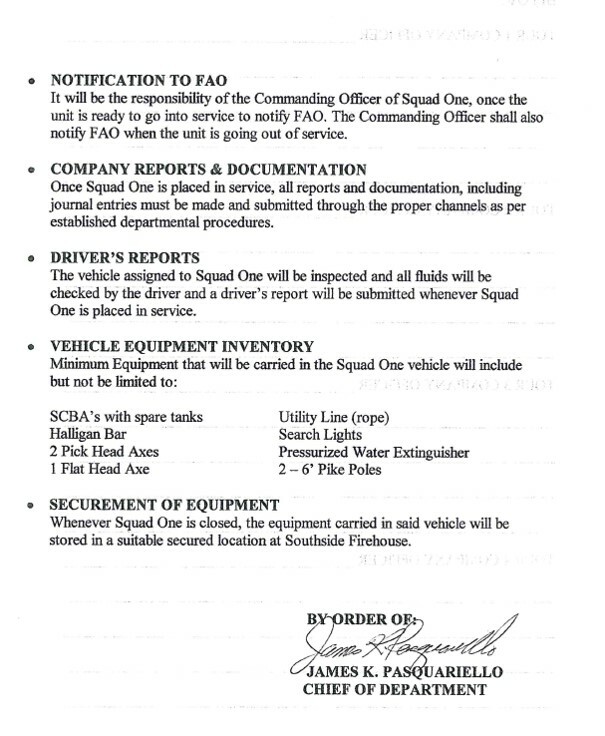 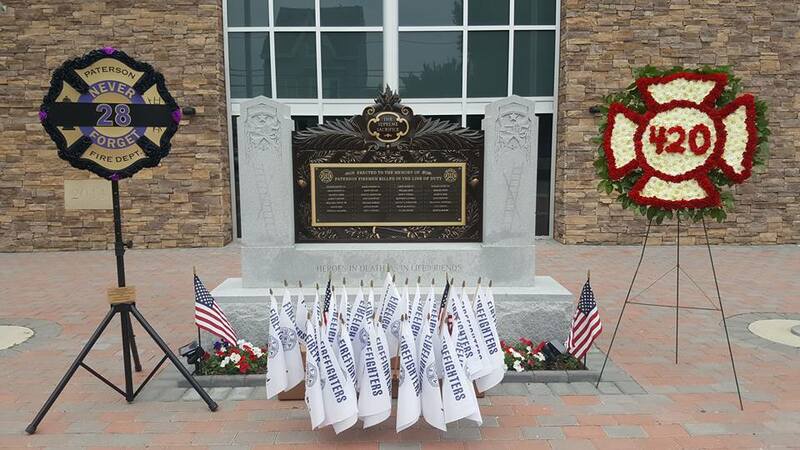 October 1, 2003: Squad 1 at Southside Firehouse closed. 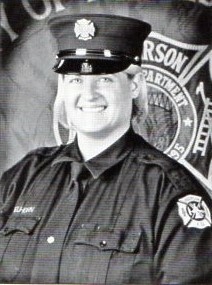 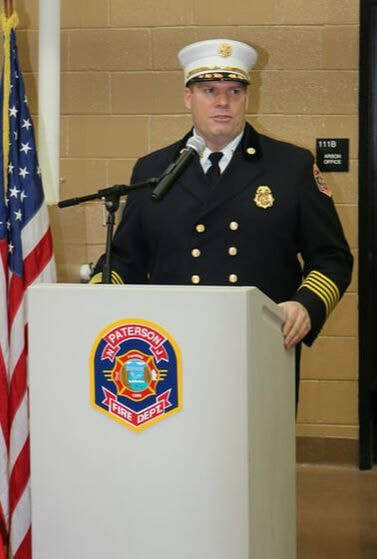 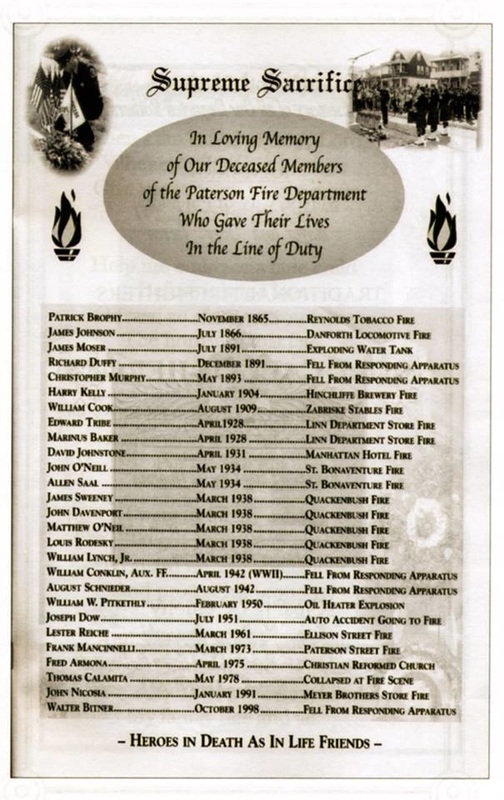 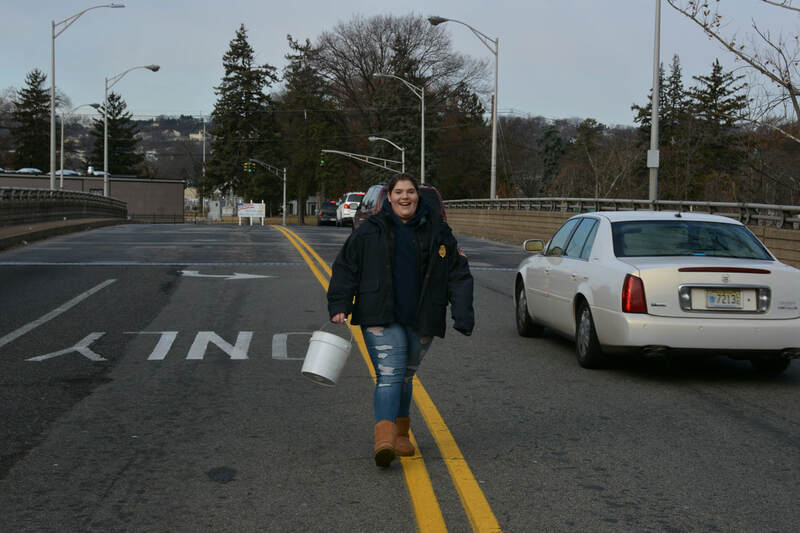 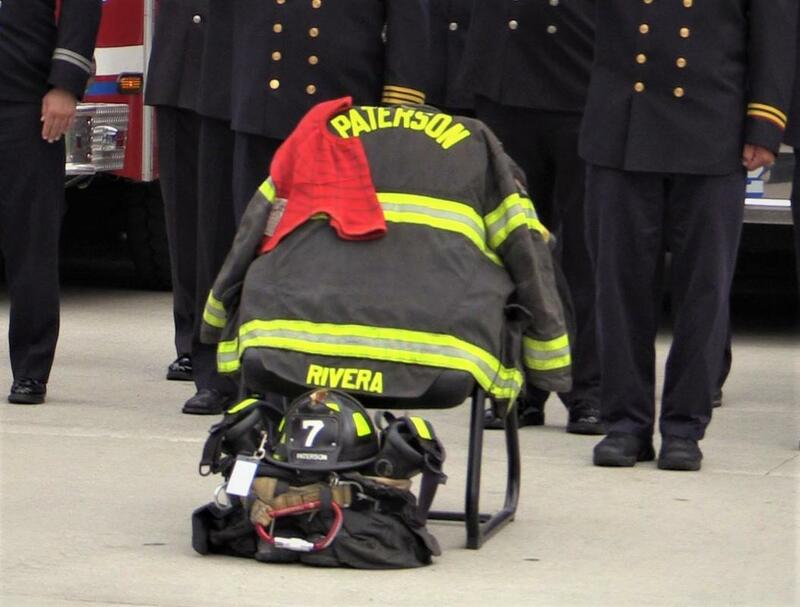 ​October 20, 2003: Elizabeth Melhourn becomes the first woman firefighter appointed to Paterson Fire Department. 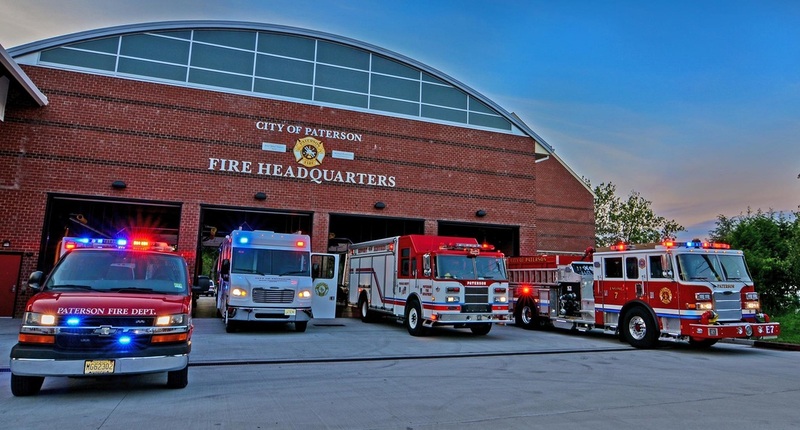 The PAS Officer is assigned to every working incident. 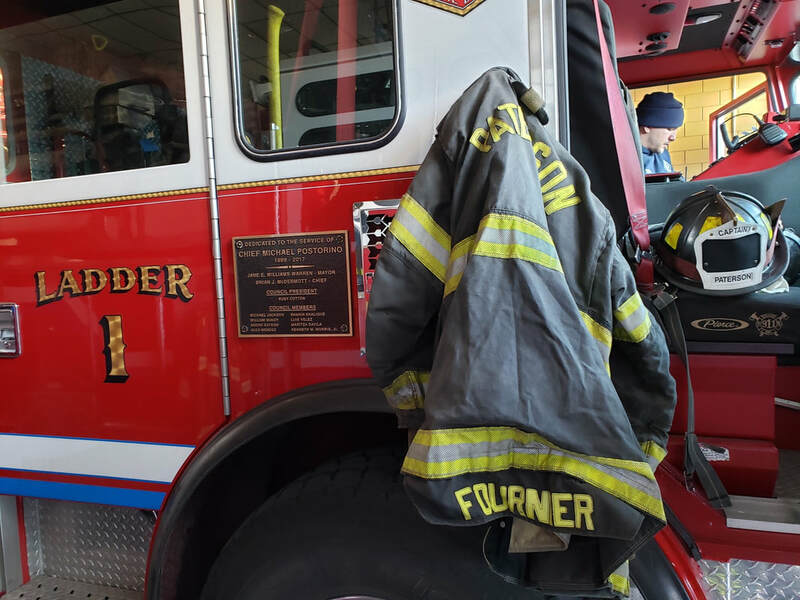 Each firefighter is issued Accountability Tags and prior to making entry into a fire building, they must leave their Accountability Tag with the PAS Officer. 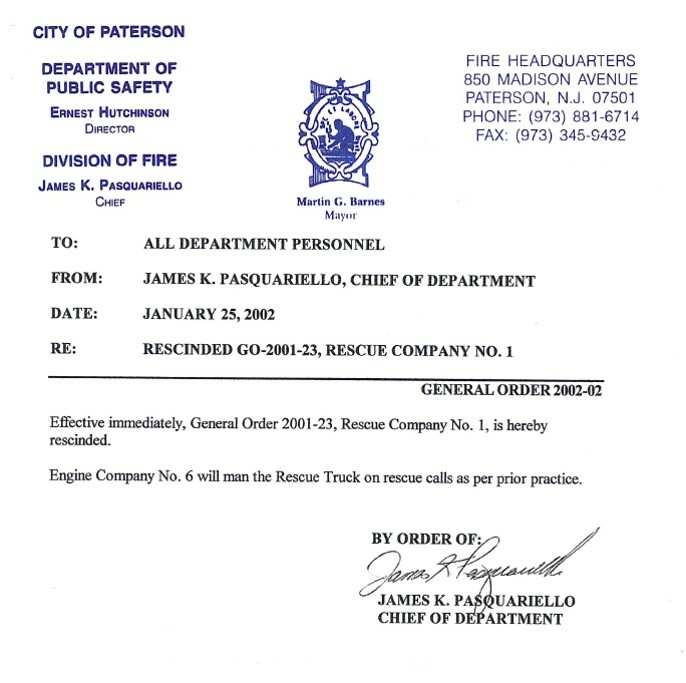 The PAS Officer tracks the location of the company or individual crews within the building. 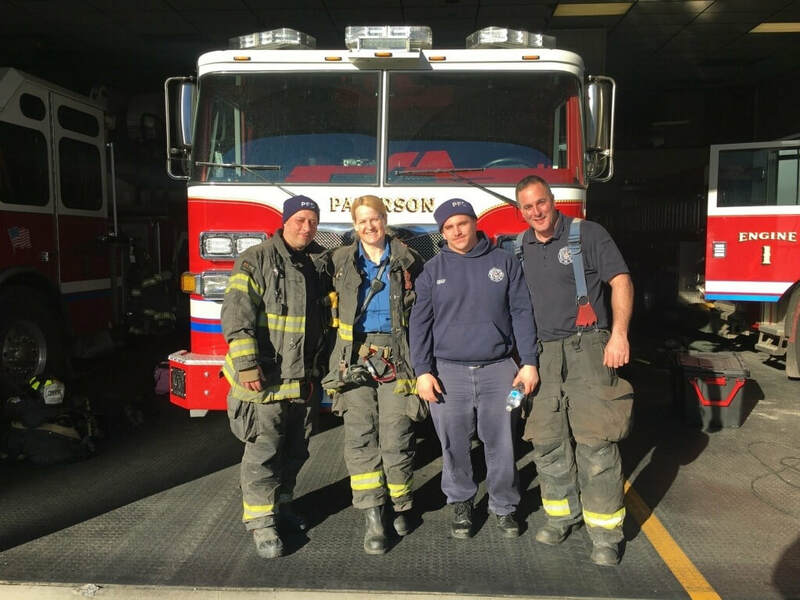 When the FFs exit the building, they check out with the PAS officer, retrieve their tags, and report to the designated Rehabilitaion Area. 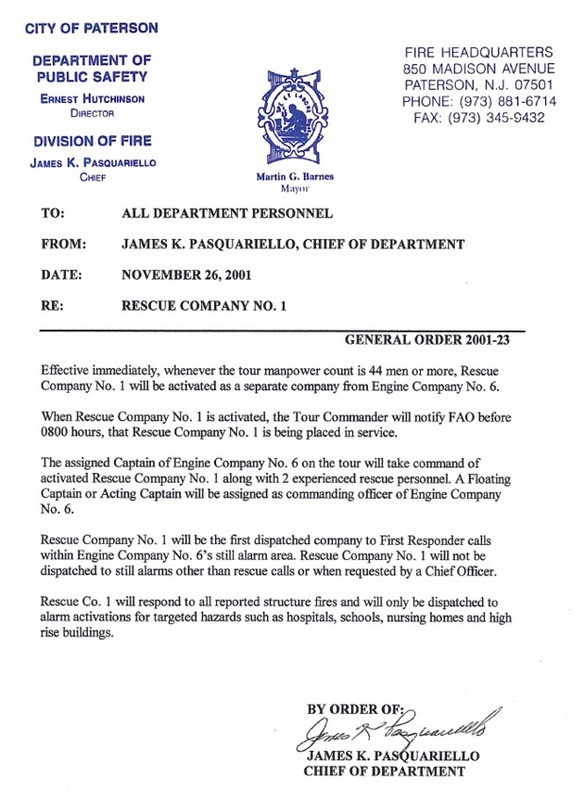 In the event of a significant change on the fireground (i.e. 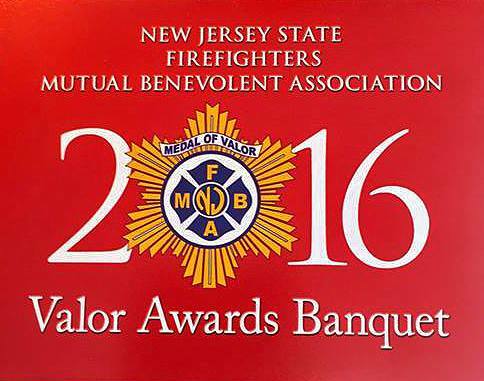 collapse, flashover, backdraft, strategy change, etc. 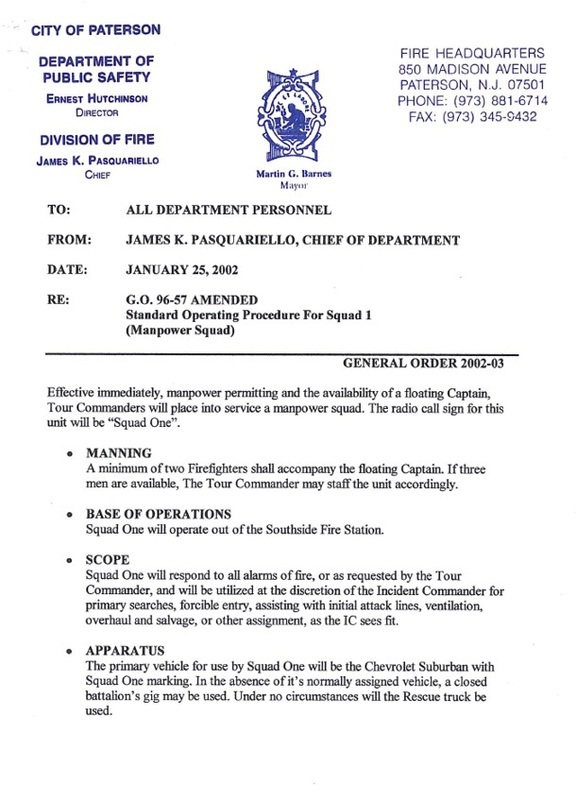 ), the PAS Officer will request a PAR (Personnel Accountability Report) and account for each member on the fireground. 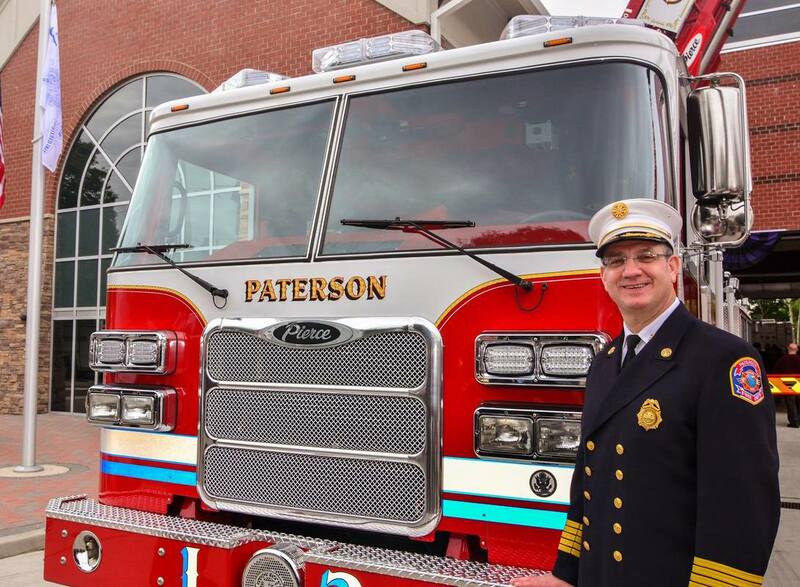 Anyone not answering the PAR would be considered missing, and the PAS Officer would be able to identify the last known location of the firefighter or crew. 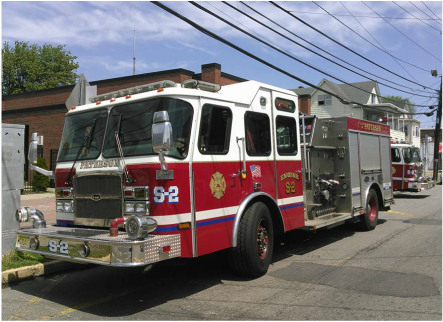 2004: Ladder 2 receives an E-One rear mounted 100' aerial painted red. 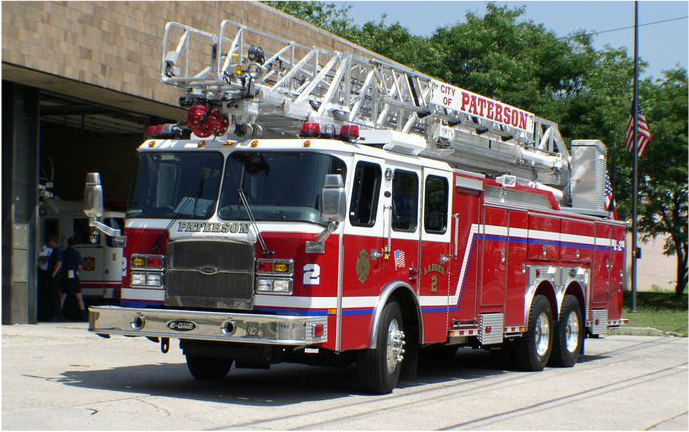 2005: Ladder 1 receives an E-One mid mounted tower ladder painted red. 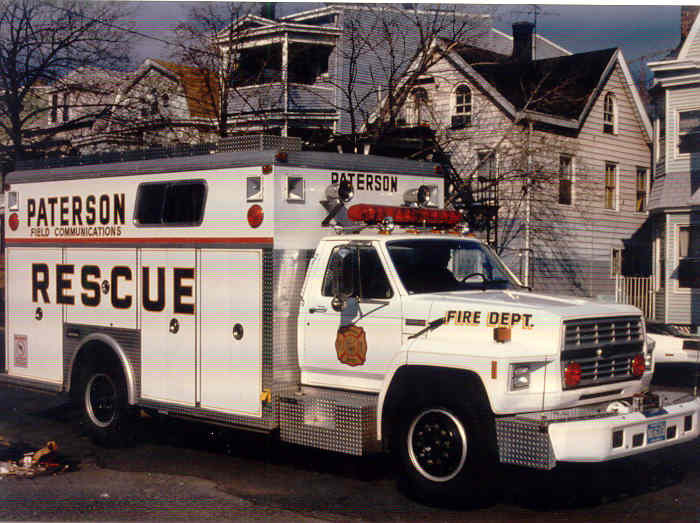 2006: 5 Emergency-One 1500 GPM pumpers painted red obtained and assigned to Engines 1, 3, 4, 5 and 7. 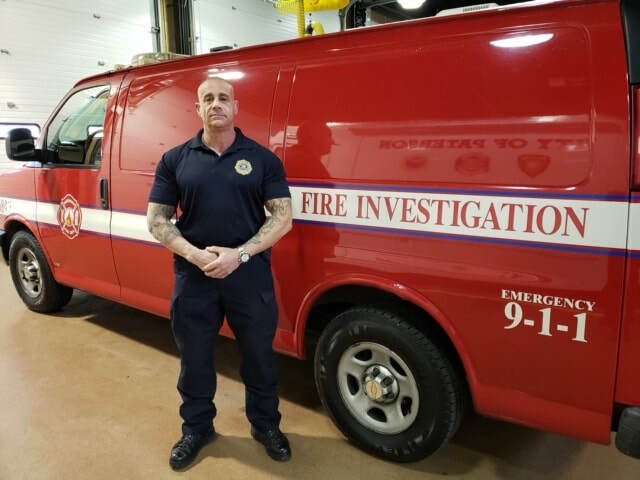 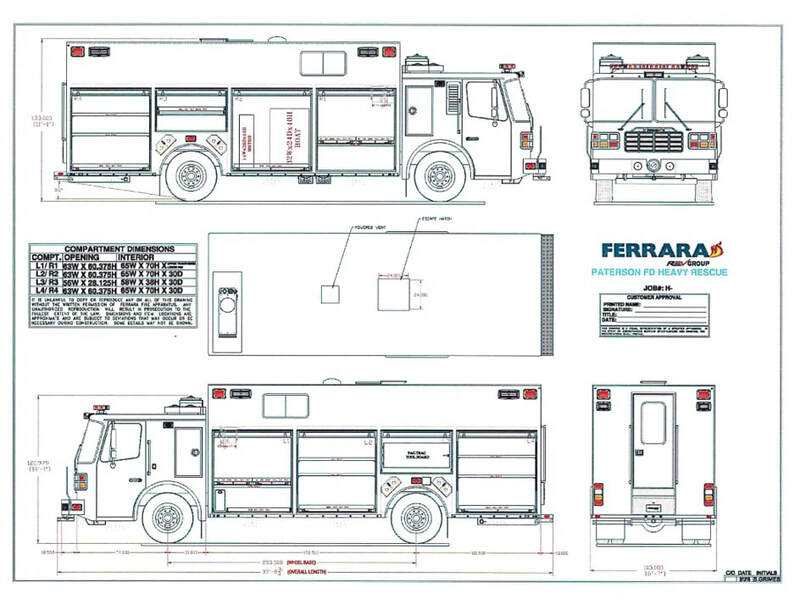 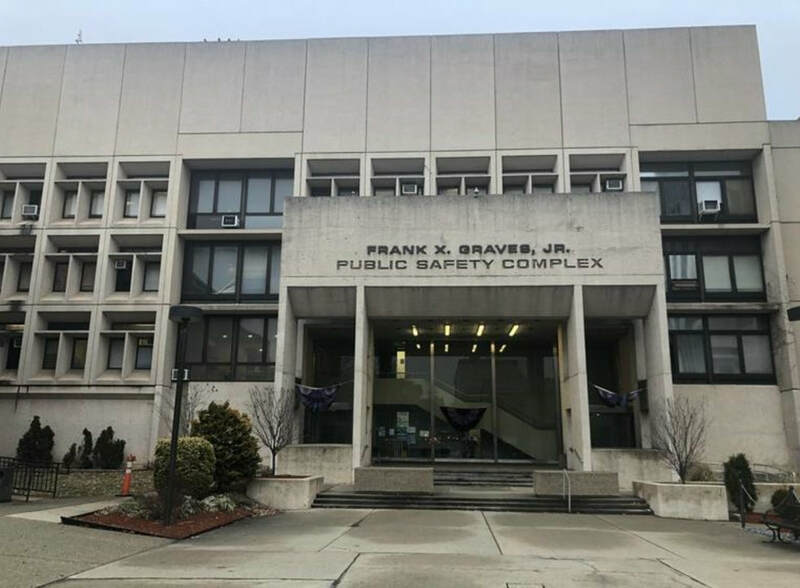 2014 ​Under the New Jersey Motor Vehicle Commission statutes & regulations (Title 39), a Commercial Driving License (CDL) is not required for FFs operating an Emergency vehicle. 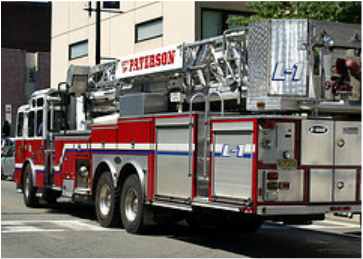 Consequently, no specialized license or course completion is required to operate a fire engine. 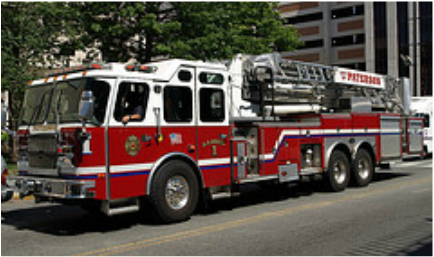 Fire recruits may receive a National accredited emergency responder driving course (i.e. 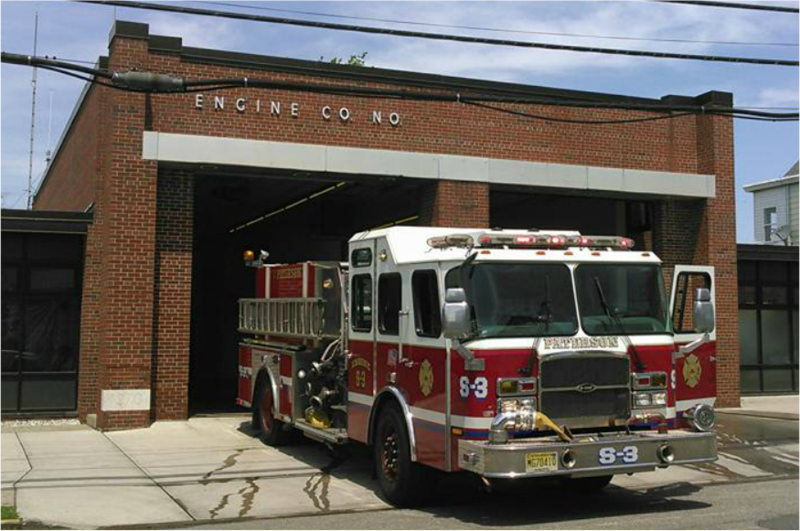 CEVO course) in the Fire Academy, driving simulator training upon graduation, and then “hands-on” training from their company officer. 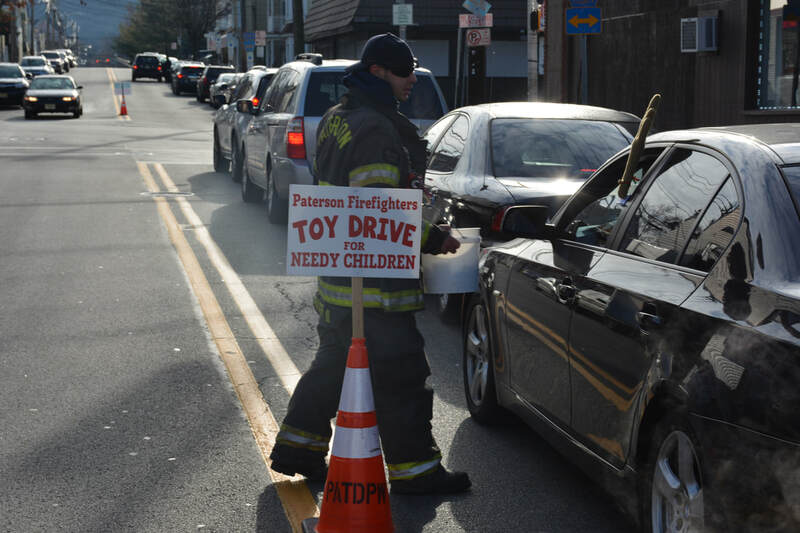 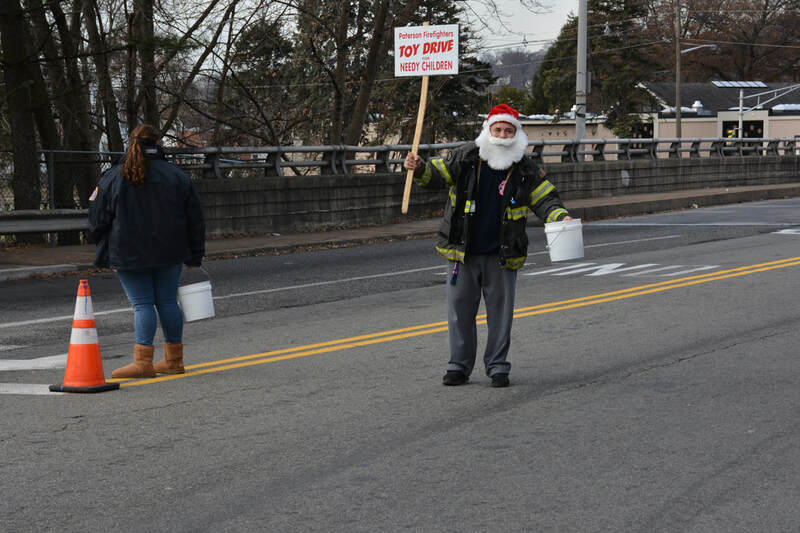 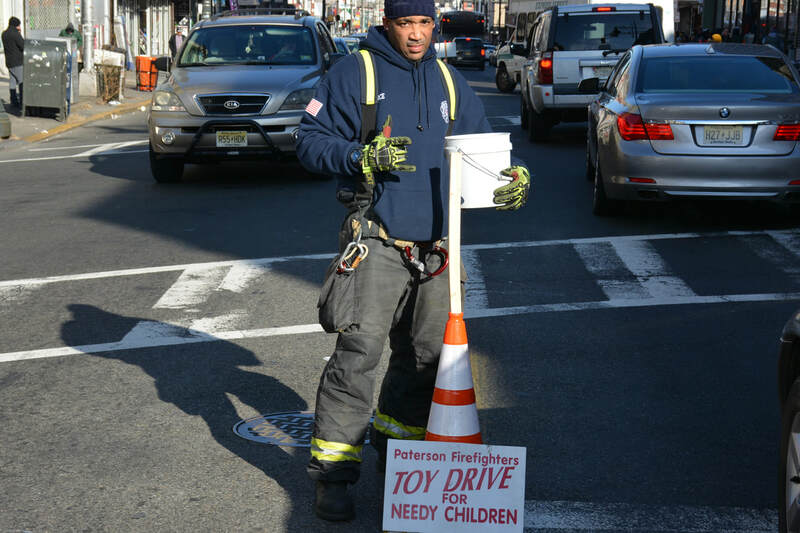 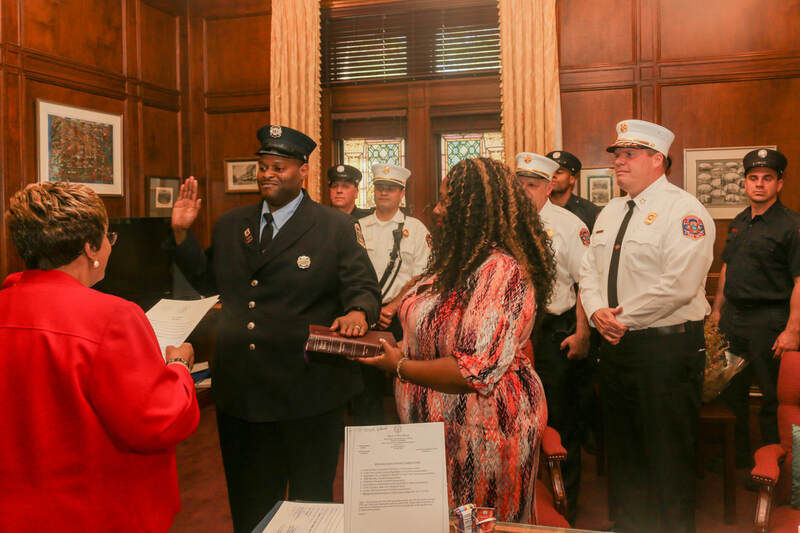 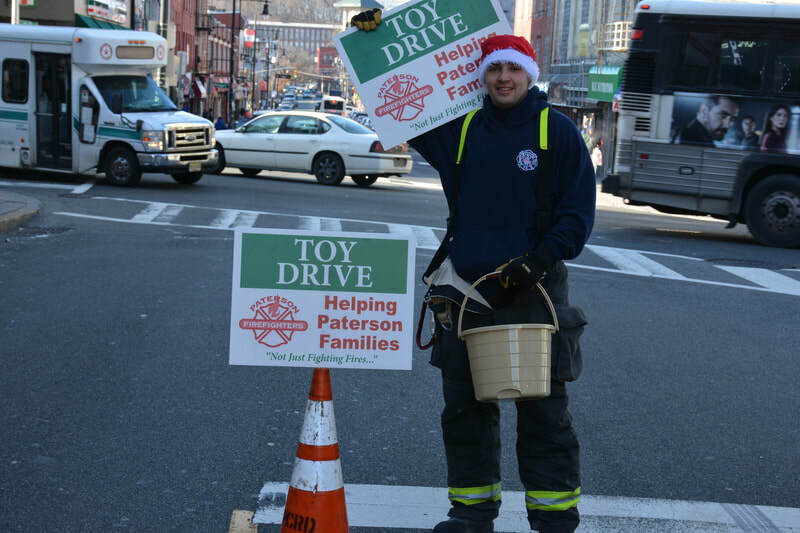 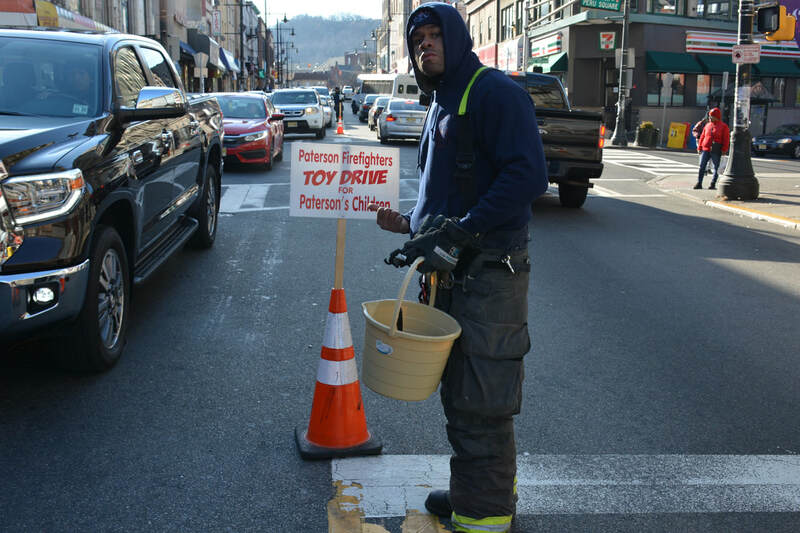 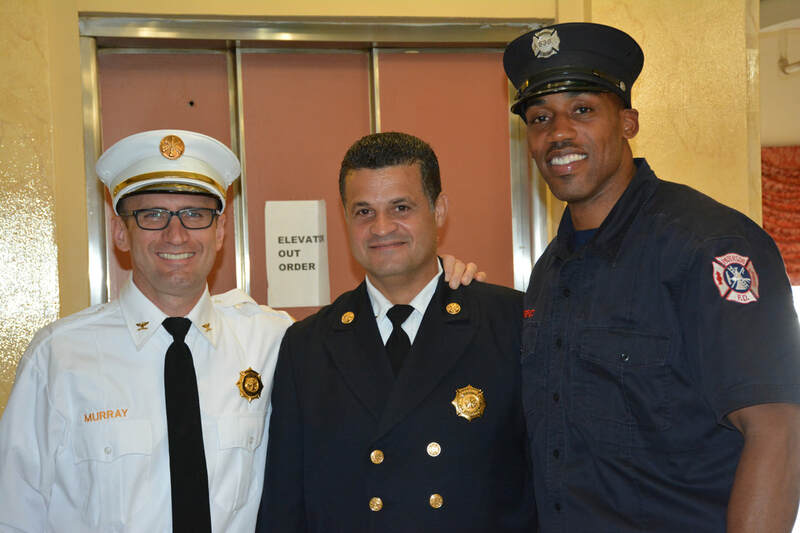 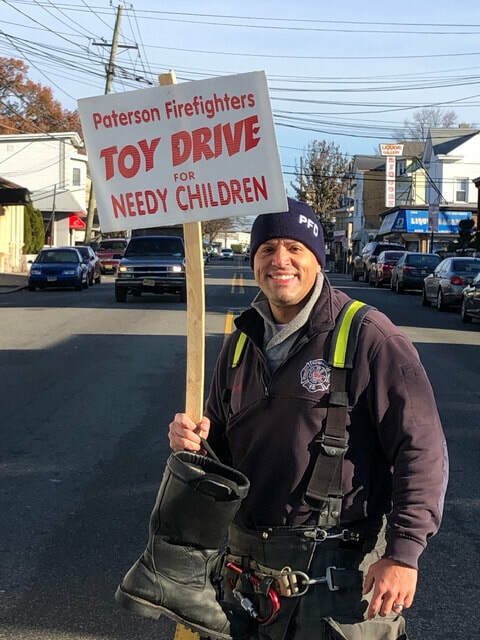 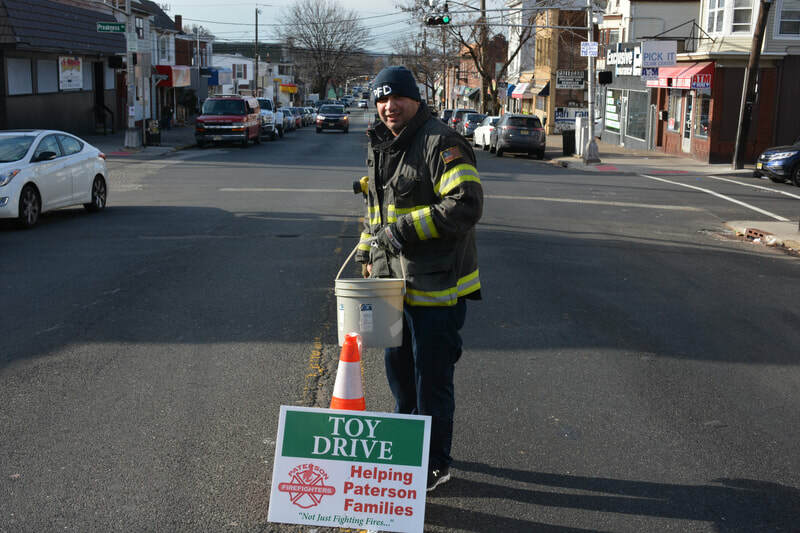 The Paterson FD does not have designated “chauffeurs.” and consequently, all company members take their turn in a driver rotation. 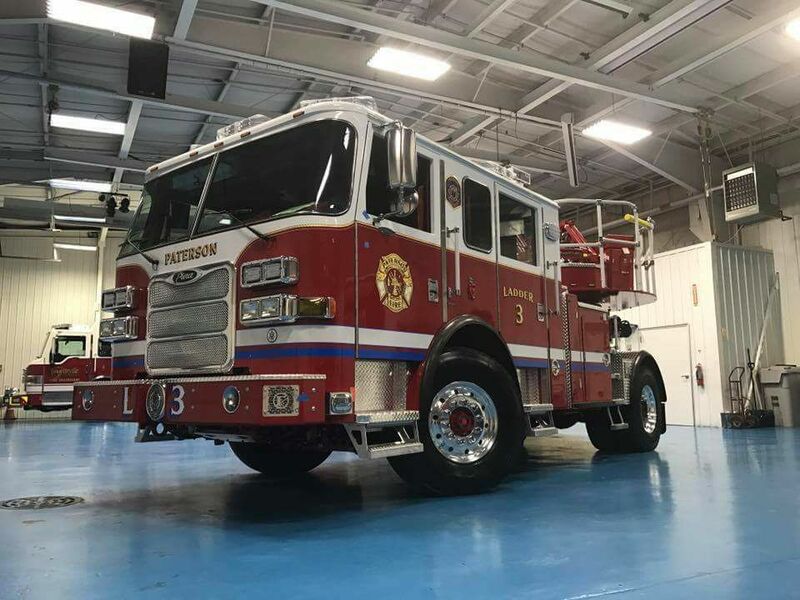 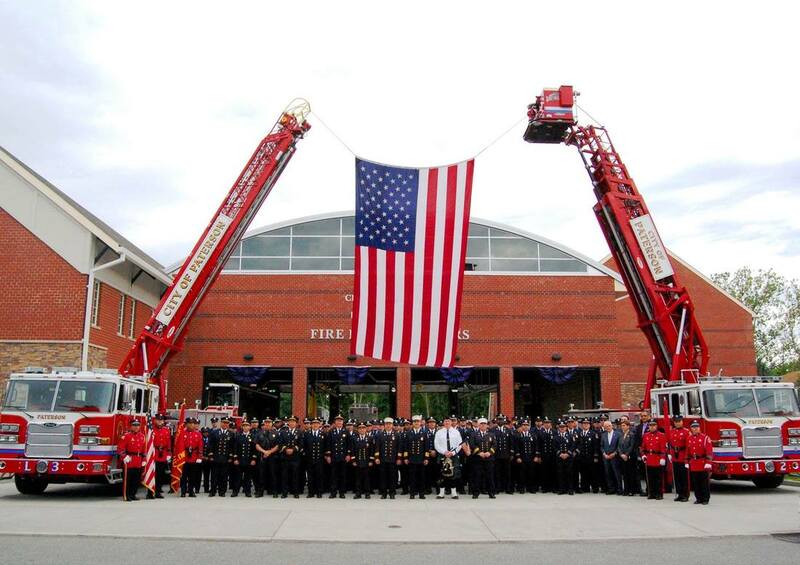 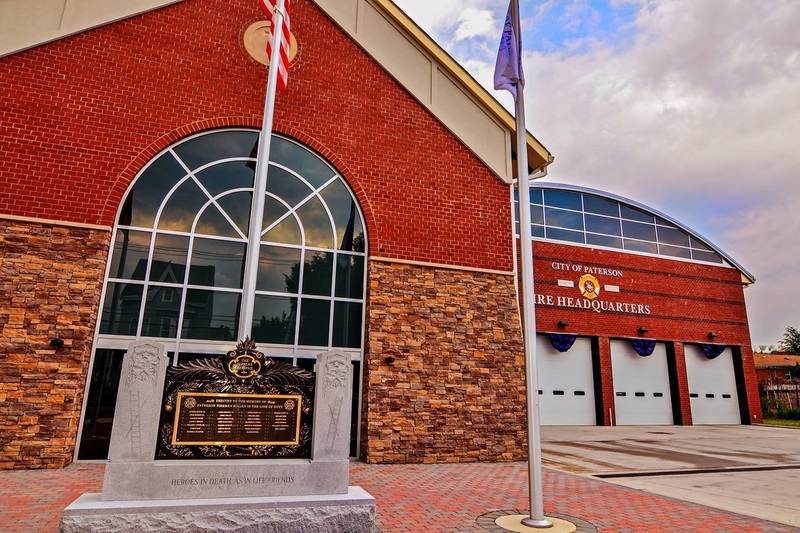 All personnel are cross-trained (in particular the double-company firehouses) so that they are proficient at operating both the Pumper & Ladder Co, including tillering. 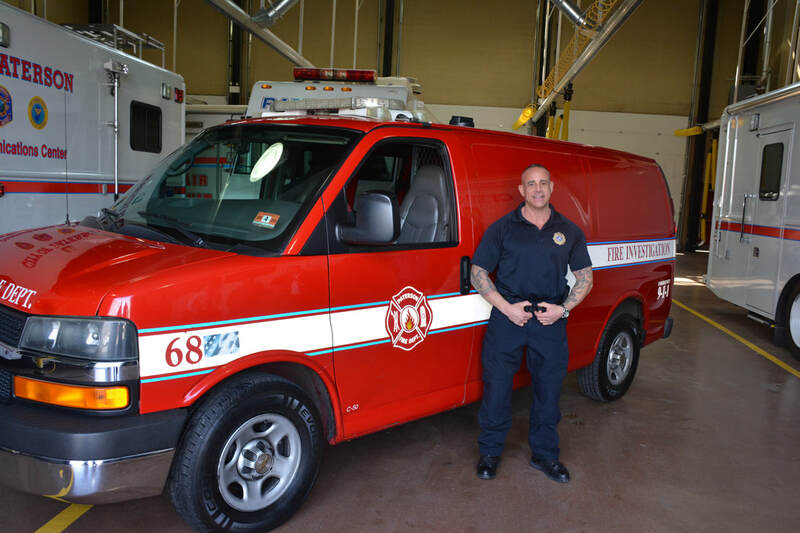 ​The Mobile Cascade Unit (unit 57) is stocked with spare SCBA (air) bottles and has an on board fill station, to refill bottles right at the fire scene. 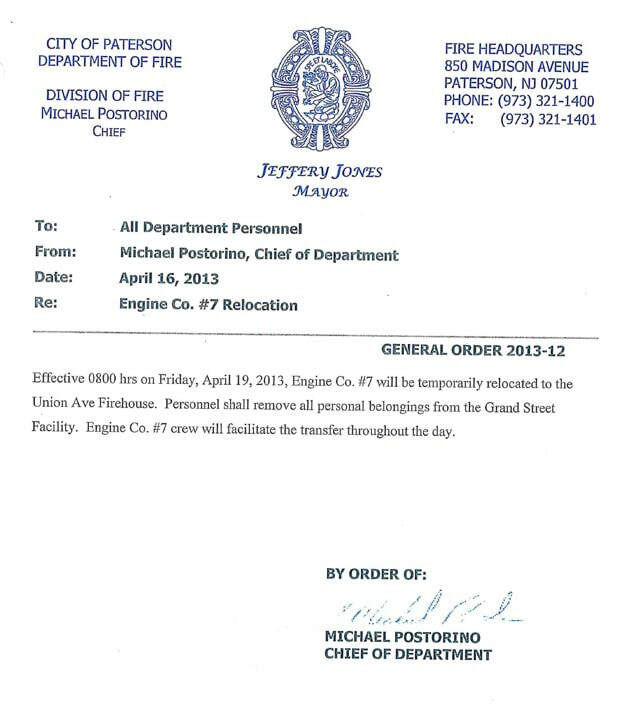 The one firefighter is assigned as a. accountability officer & tracks all personal entering & exiting the fire building. 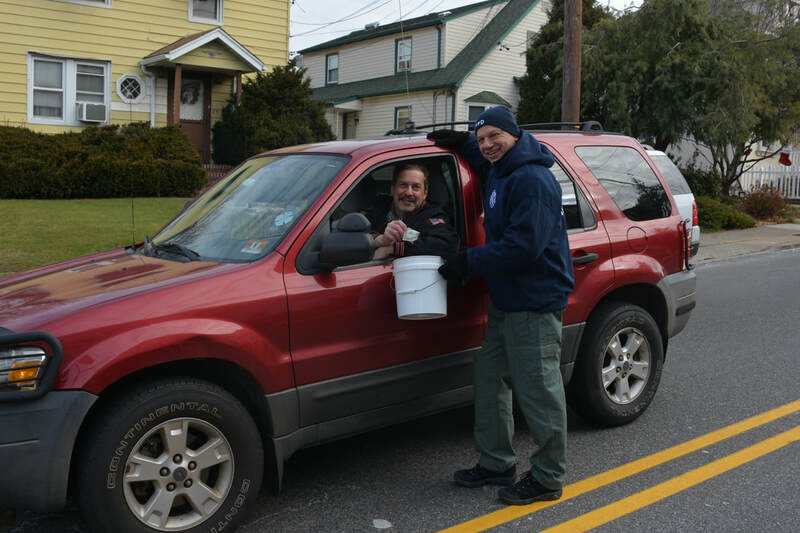 The REHAB officer refills bottles & coordinates with EMS to set up an area where firefighters must report to after exiting the building. 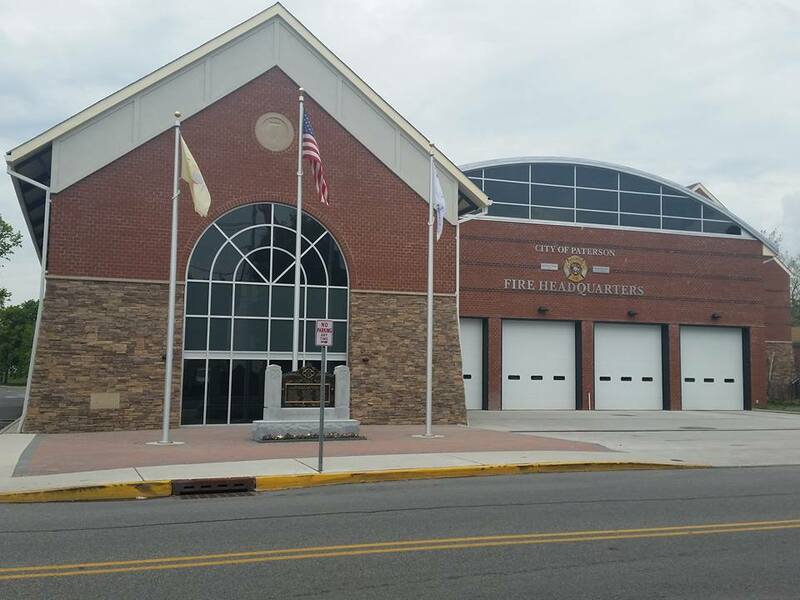 For 3rd alarm fires, or fires with extreme temps, St Joseph's Hospital responds with a Mass Care Unit for Rehab (tents, fans, heaters, etc). 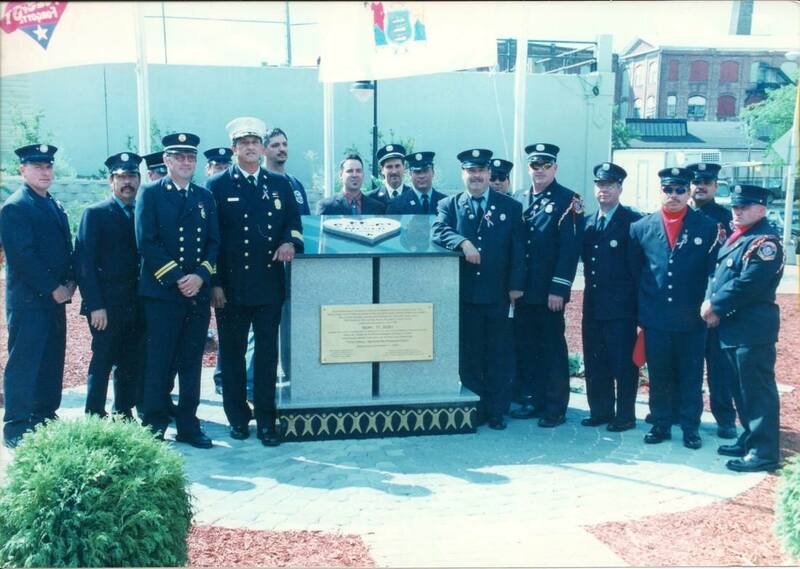 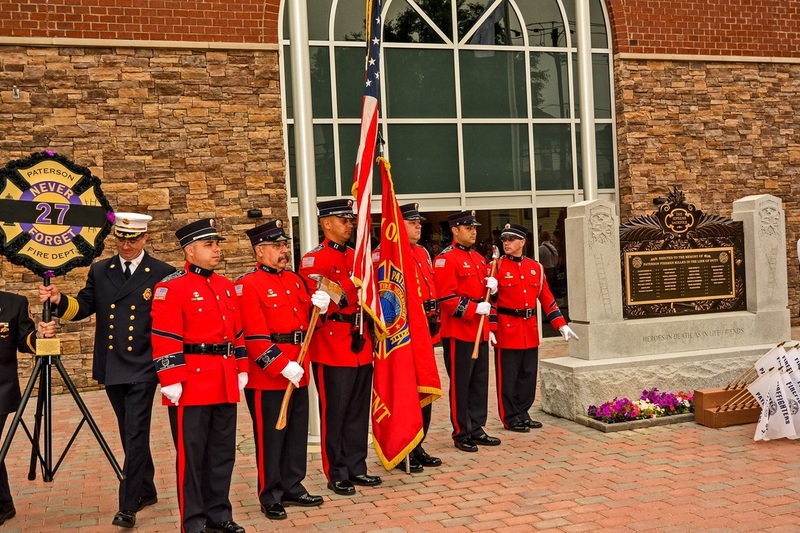 Below photo is Honor Guard: Captain AJ Woods, firefighter Luis Vega, Captain Dave Molina, Captain Michael Walker, firefighter Ron Humphries, Captain Scott Parkin. 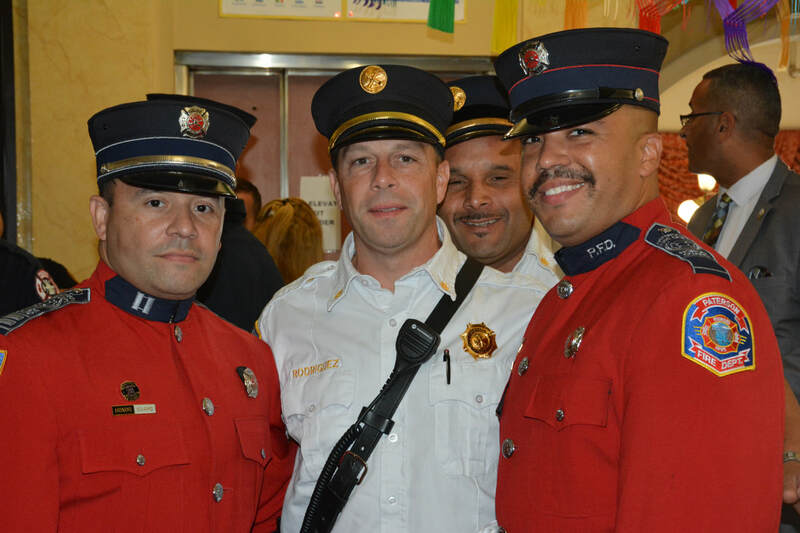 Chief Postorino at left. 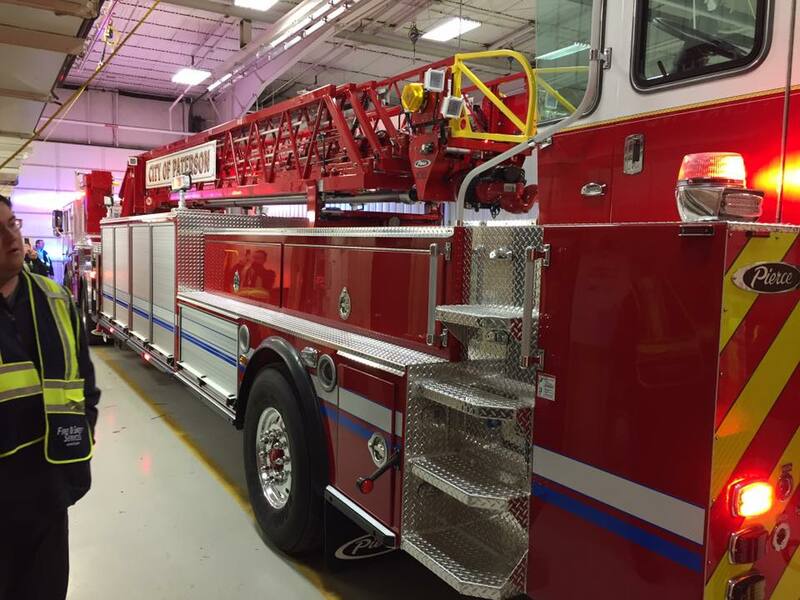 December 27, 2017: New Pierce Arrow Tower Ladder for Ladder 1 arrives at Headquarters on McBride Avenue. 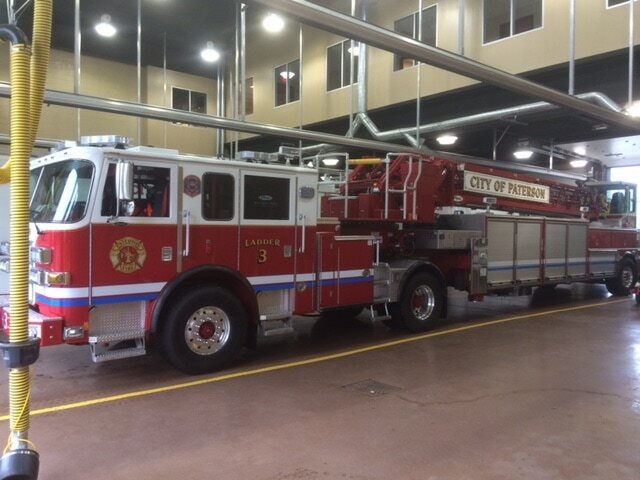 It started service January 10, 2018. 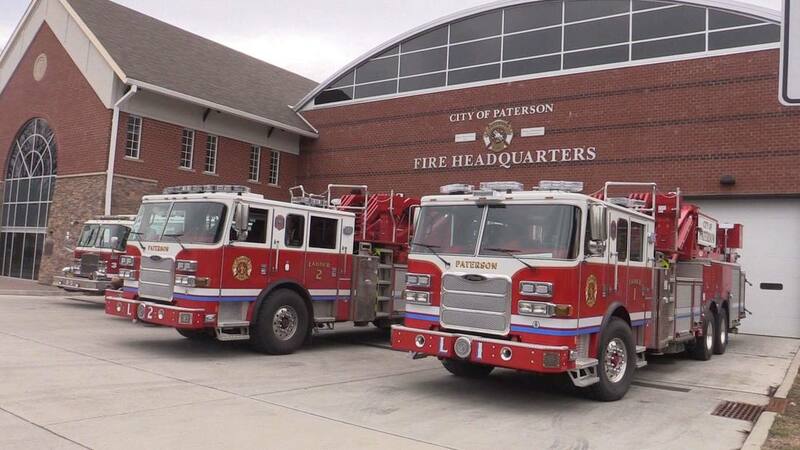 February 26, 2018: Unusual presence of the two Pirece Arrow Ladder (L2 a 2015 model and L1 a 2017 model) Trucks with Engine 3 (E-One pumper) at headquarters. 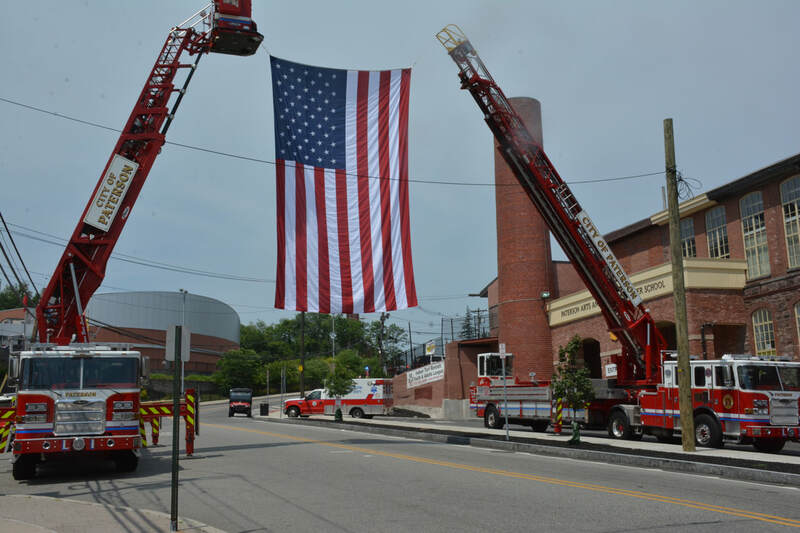 April 24, 2018: Funeral procession for PPD LODD of Officer Tamby Yagan. 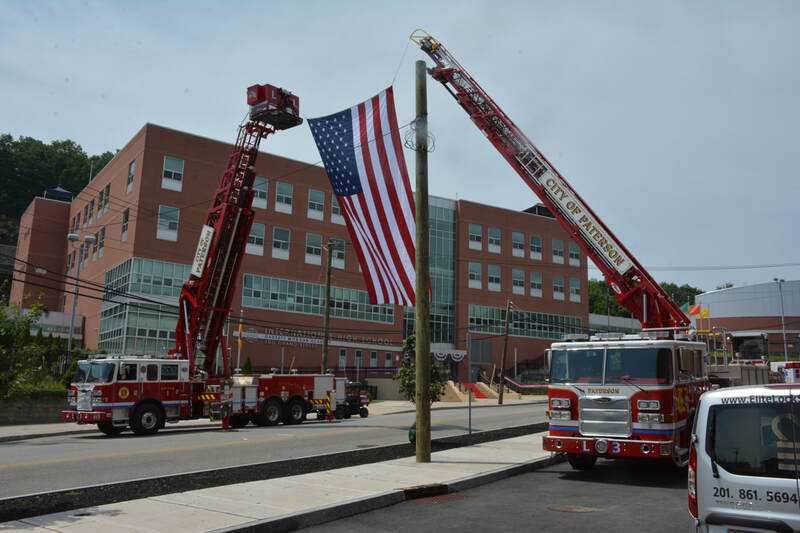 PFD had its newer ladder trucks (L1 and L3) displaying the flag at the Grand Street (old Firehouse of E11 and E7) where the officer worked. 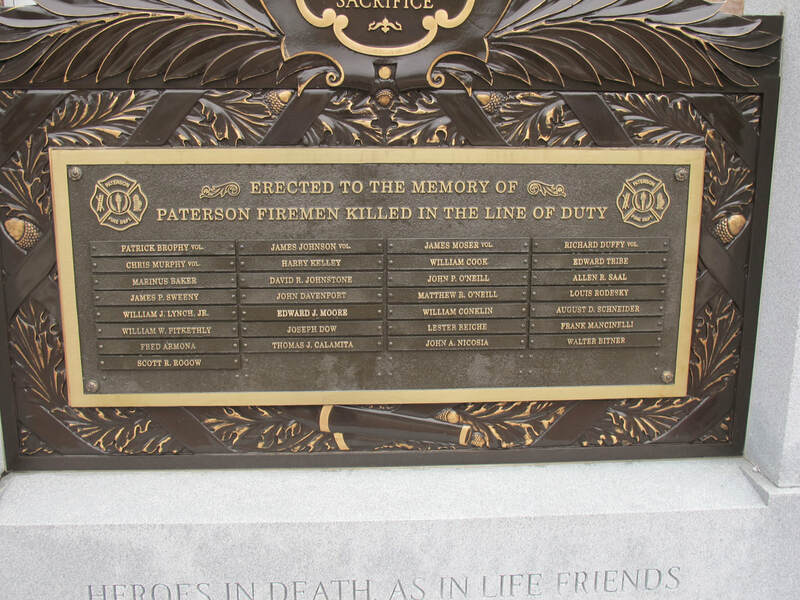 Several on duty PFD companies lined the route in formation. 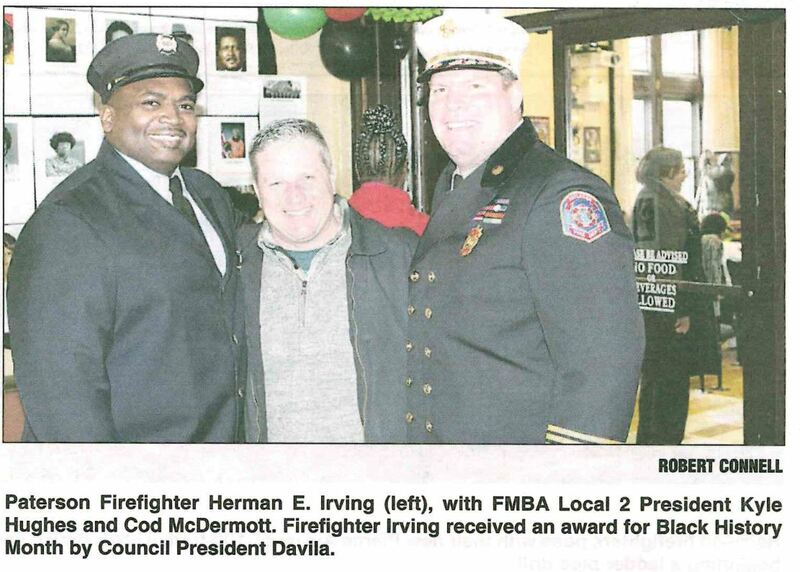 DC Pablo Del Valle, DC Kevin Hancock, Mayor Jane Williams-Warren, (behind Mayor not visible PFA Vice President Scott Wilson), Capt. 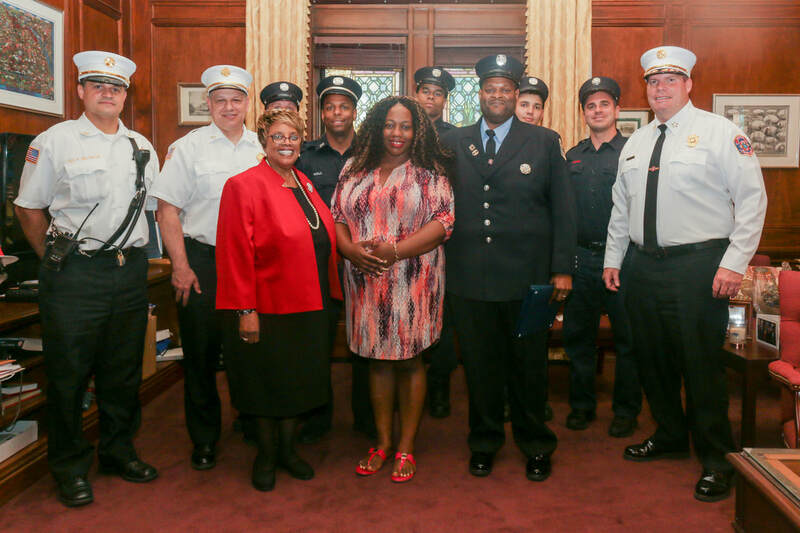 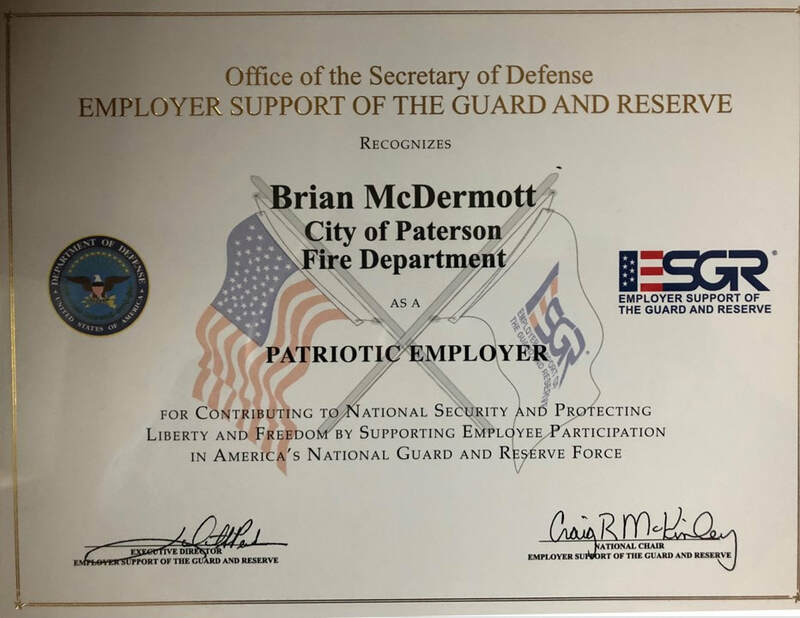 Michael Hall, Mrs. Deborahe Ayers (wife), FF Jihad Dunham, FF Troy Ayers, FF Nicholas Perez, FF Anthony Reddin, Chief Brian McDermott. 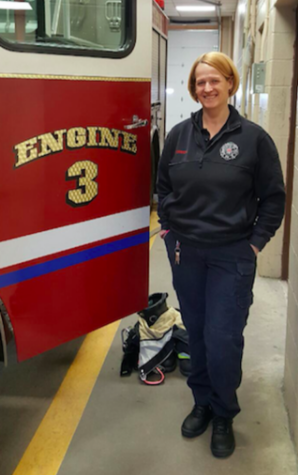 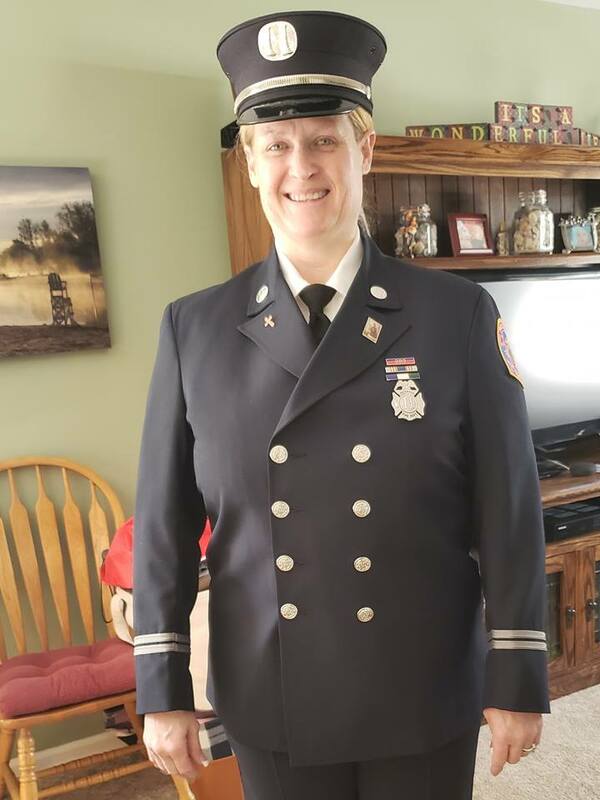 ​June 6, 2018: Beth Melhorn Fournier was promoted to the rank of Captain becoming the first female fire officer in the history of the department. 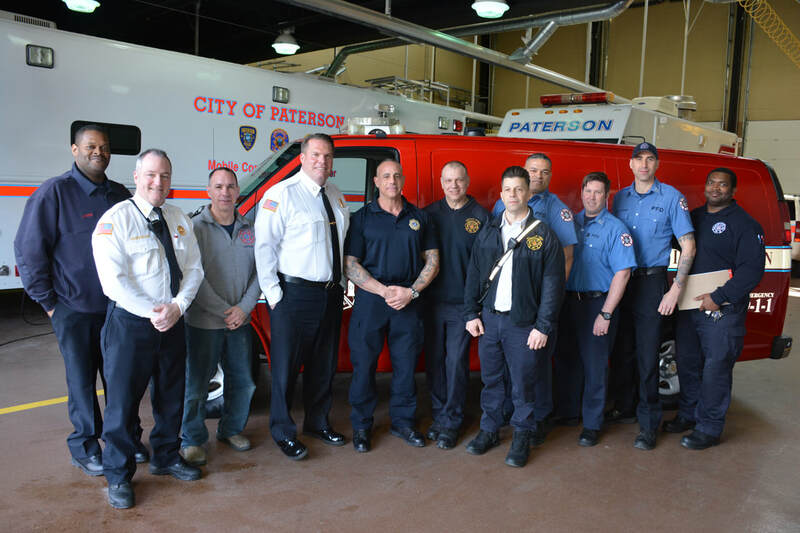 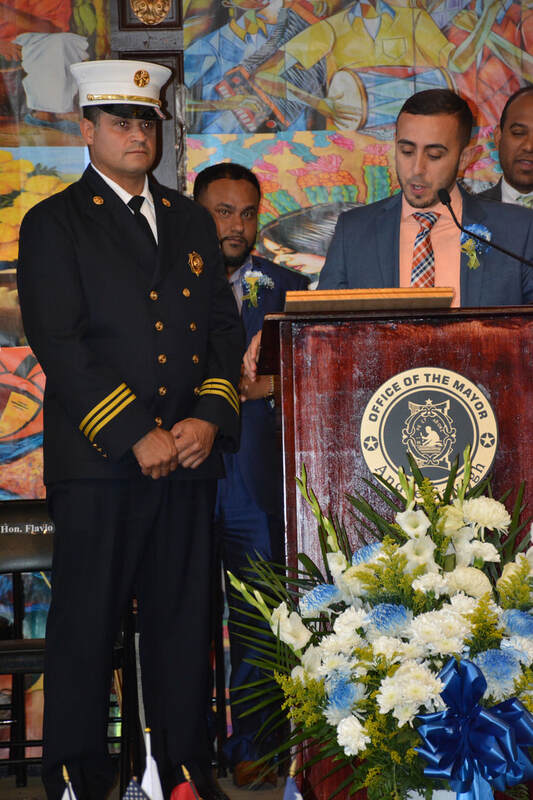 November 19, 2018: Two new ambulance units enter service: 98 joins 94 at Northside Firehouse and 99 joins 91 at Madison Avenue. 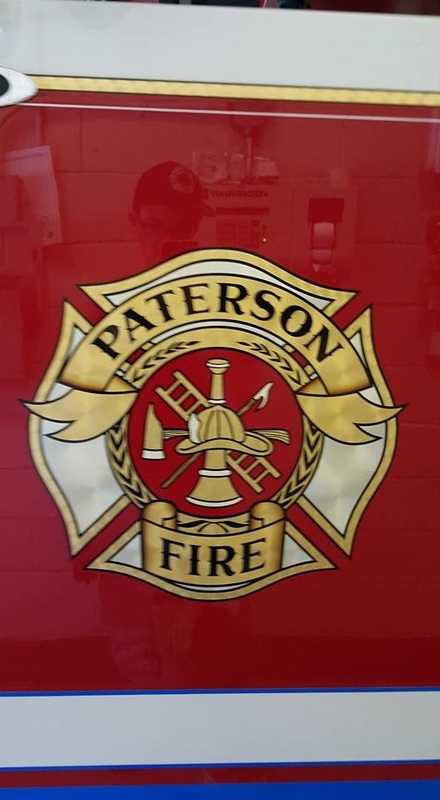 PFD now serves Haledon, North Haledon, Prospect Park, William Paterson University and at times Woodland Park. 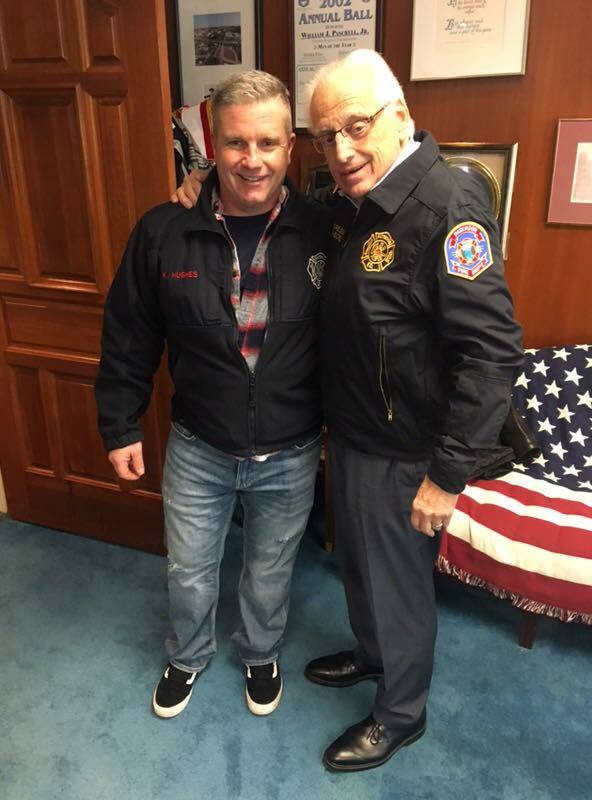 December 2018: Congressman William Pascrell wearing a jacket presented by PFA President FF Kyle Hughes. 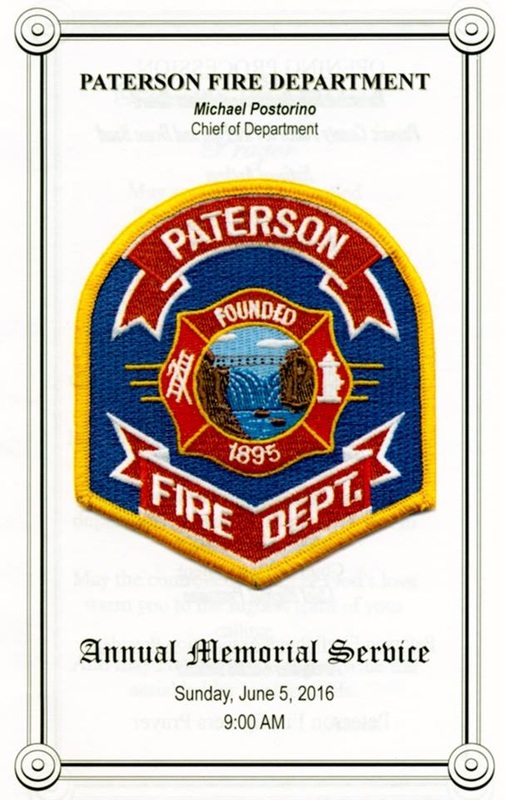 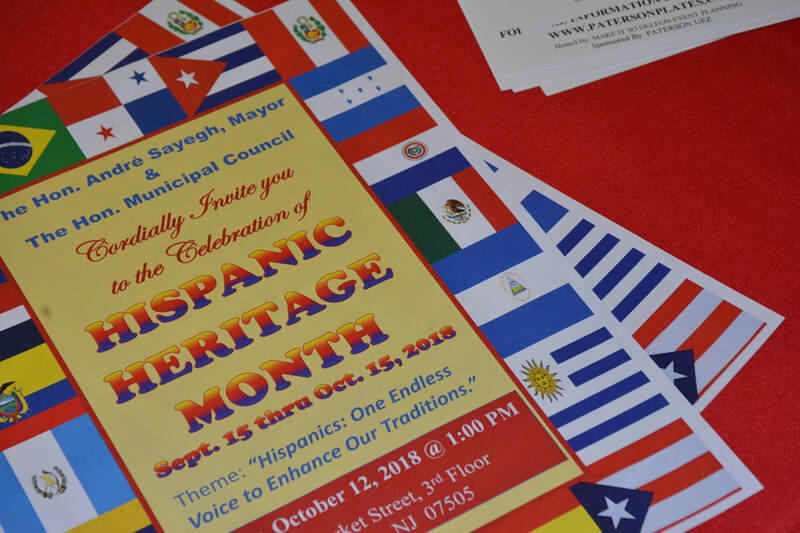 The jacket is embroidered in gold lettering “Congressman B. Pascrell" and a Maltese Cross (also in gold) as well as an American Flag. 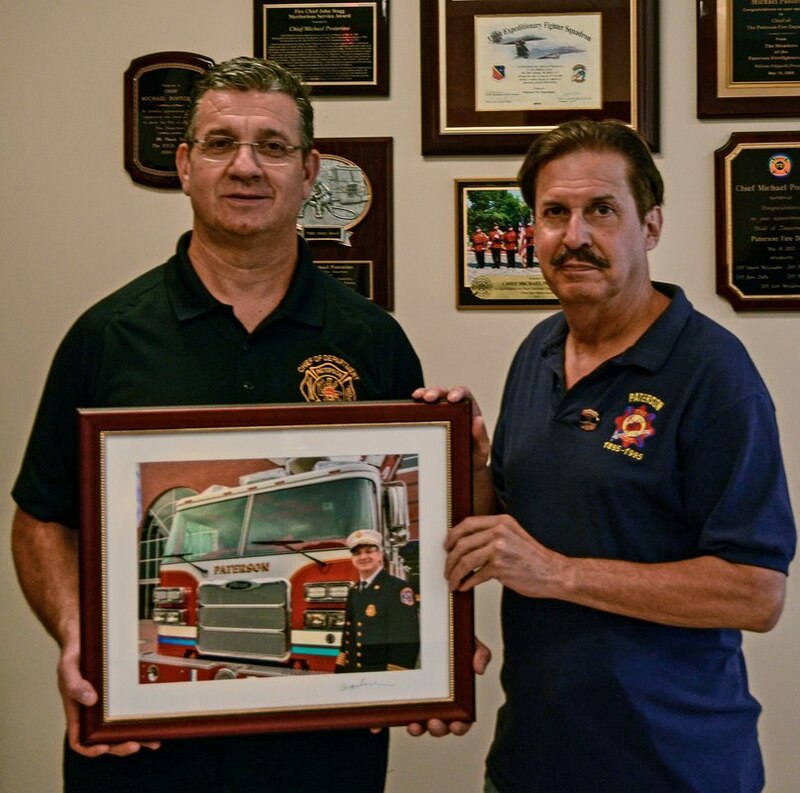 The Congressman has been a tremendous champion for Firefighters Nationwide always beginning with his hometown. 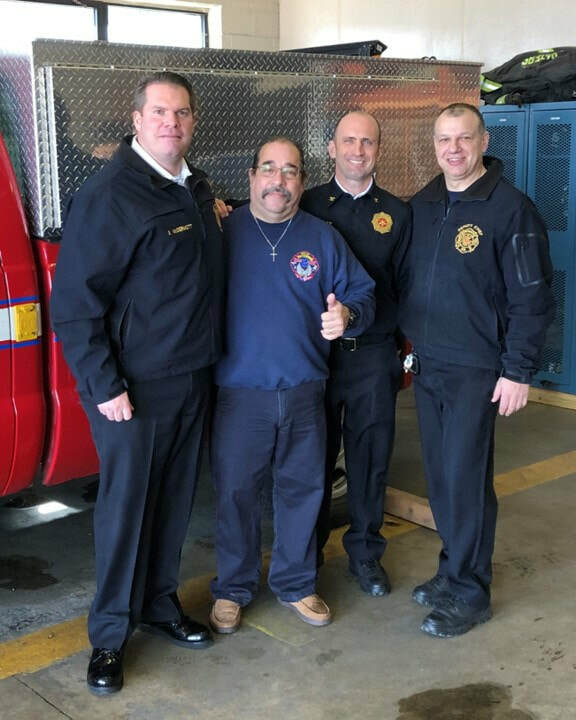 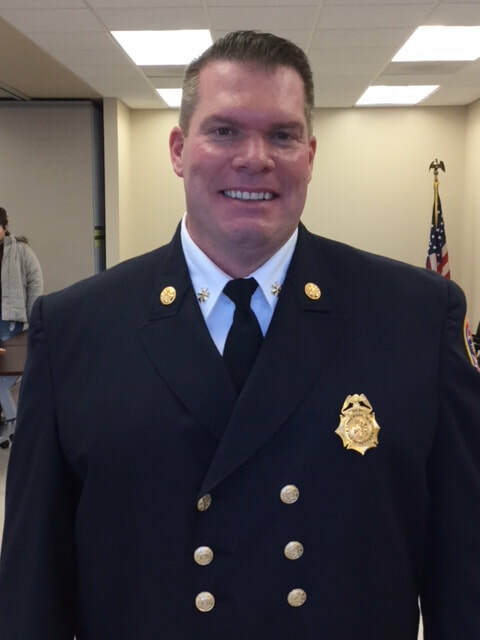 March 27, 2019: Last day of duty to retiring FF Lou Iandoli (official retirement date is April 1, 2019). 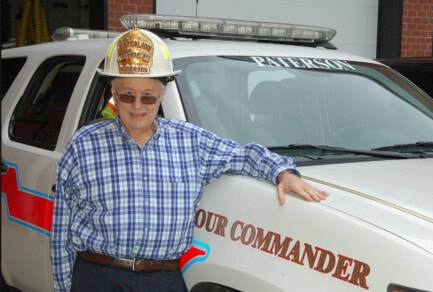 "First Due Lou"